A few months ago marked the 10th anniversary of Hurricane Katrina's devastating impact on New Orleans and much of the rest of the Gulf Coast. 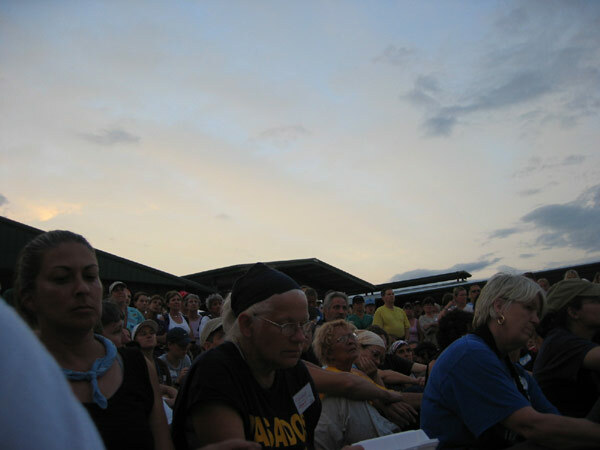 At the time, I shared my trip journal from 10 years ago detailing our experience volunteering for 5 days in the wake of the Hurricane, I shared the memories that have stayed with me most, and the long term impact of Hurricane Katrina of the PETS Act -- which recognized pets as part of the family in evacuation scenarios. 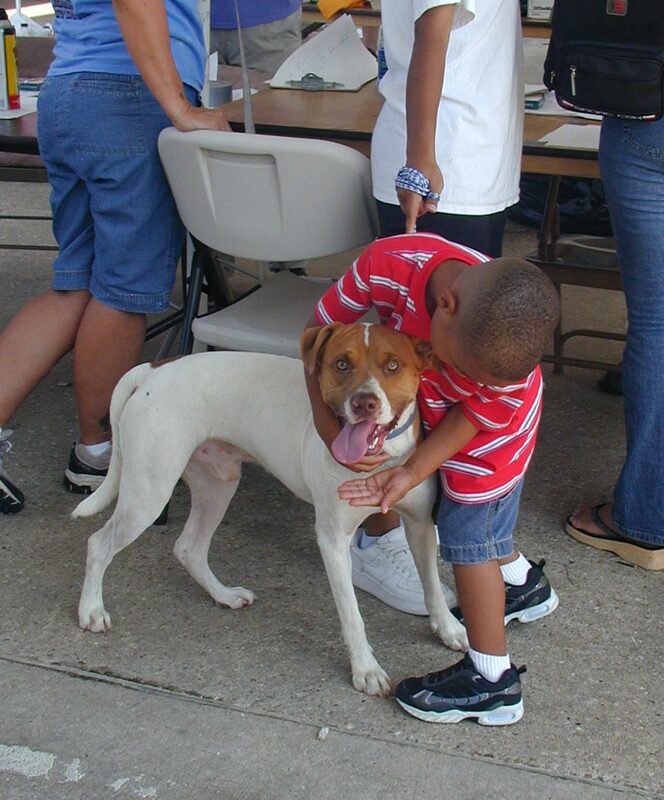 And while there has of course been a substantial long-term impact following Hurricane Katrina for the families impacted by the storm, and for the communities that continue to rebuild, there is another long term impact for animals that has gone virtually unnoticed-- and that's the impact on pit bull-like dogs in this country. But to understand the impact, we need to take a little trip back -- to what feels like forever ago. 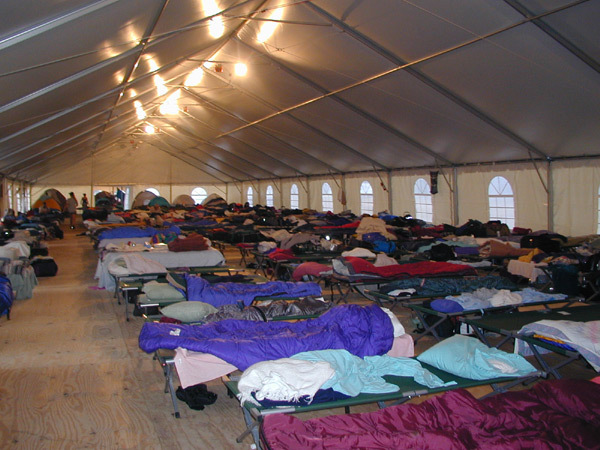 In 2005, sheltering looked much different than it does today -- at least in many places. 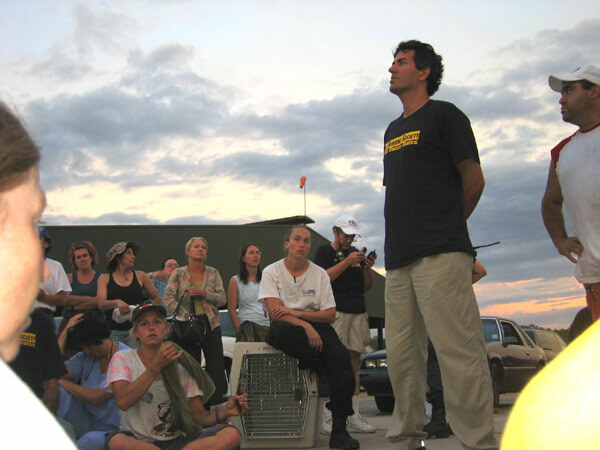 No kill, as a movement, was pretty new and the impact was not felt in most places and many/most public shelters were very high kill. Many also had strong prejudices against certain types of dogs. I'll use Kansas City as an example -- because I'm most familiar with the situation -- but also because its story is pretty typical of the situation in 2005. In Kansas City, the shelter was high-kill -- with roughly 65% of the animals being killed in the shelter each year. The shelter's policy for pit bull-like dogs was that if they came to the shelter, they would return them to owners and there was one pit bull rescue group in town that was allowed to pull pit bulls from the shelter. 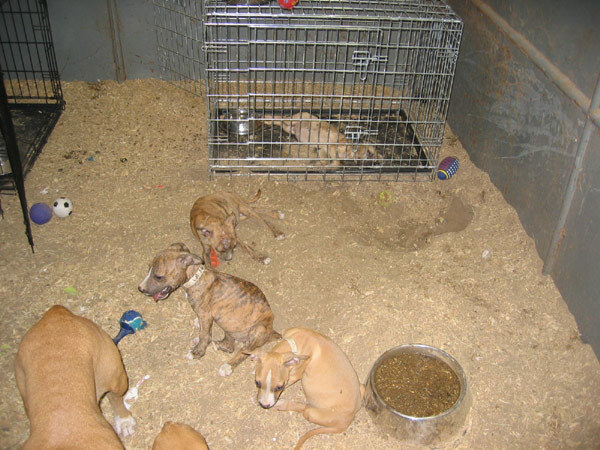 The rest were killed and never given a chance for adoption. These polices, combined with a lot of negative media attention led to a simple reality - -unless you were a volunteer for the pit bull rescue group in our community, or owned a pit bull, you had little to no exposure to them. The lack of exposure led a LOT of people to believe only what they heard, or read about pit bulls because they had no other basis for their opinion. Which meant, that even in the animal welfare community, pit bulls didn't necessarily have a great reputation. Indeed, many of the major national groups at the time had policy papers that were disparaging against pit bulls. They had a bad rap -- even among many in animal welfare. 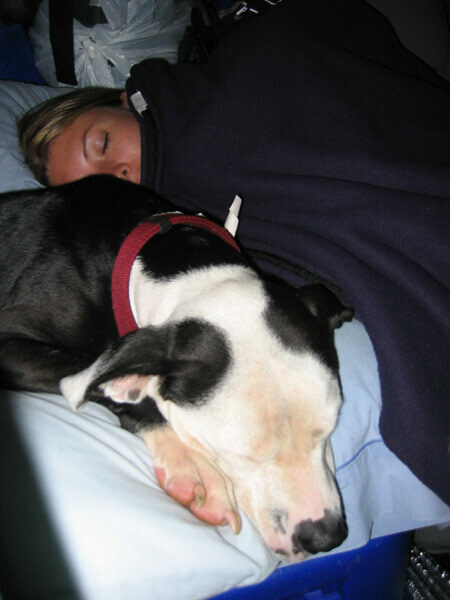 Which made the group of people who knew that pit bulls were indeed good dogs fairly small. 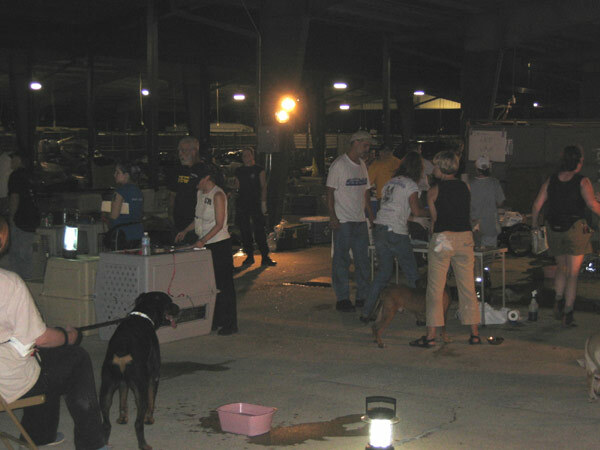 In the days following Hurricane Katrina, we began to get word of all the animals that needed help in the Gulf Coast region. Our friend got a text from a friend of hers that said "almost all the dogs are pit bulls, and a lot of people here are afraid to work with them." Well, I definitely wouldn't have considered myself an expert on pit bulls - but I wasn't scared of them. And that was motivation we needed to head to Gonzales, LA to help at the Lamar Dixon staging camp. In the days that followed, our experience was like that of many others. We worked with the dogs. And, a significant majority of the dogs were pit bull-like dogs. 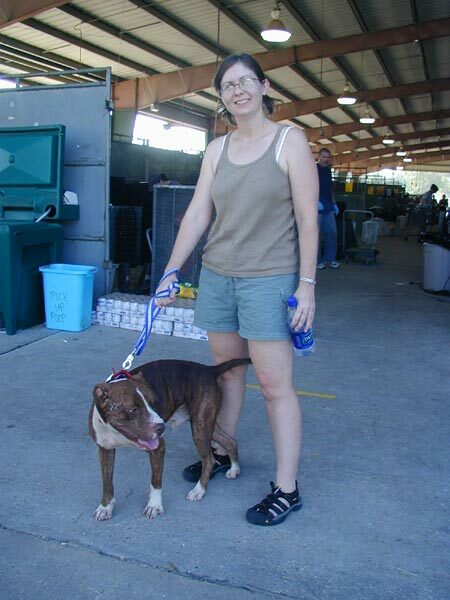 And if you were helping at Lamar Dixon, or many of the other staging sites, you were helping with pit bulls. If you were afraid to work with pit bulls you weren't going to be a lot of help. 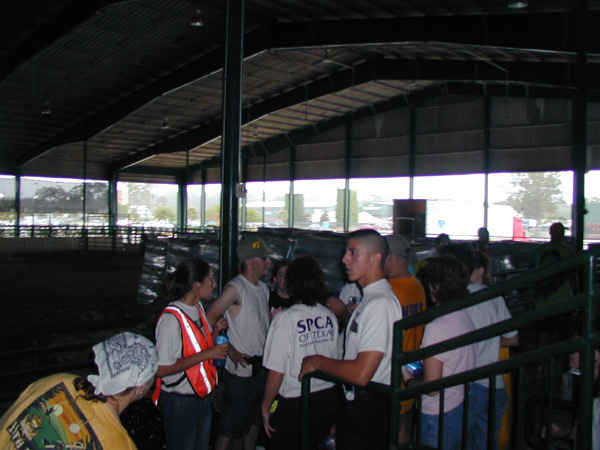 And the end result was that hundreds, maybe thousands of volunteers from around the country, many of whom had had very little interaction with pit bulls in their years of working in animal welfare, began working with the dogs for the first time. I've seen a lot of comments that verify that this was, indeed, their experience. And nothing creates a more positive image of pit bulls than working with the dogs. Because in spite of this being a challenging situation for the dogs and the people, the dogs were....amazing. As the months that followed, these volunteers went back to their communities and began talking about their experiences -- and talking about the dogs. In addition to the stories, many iconic photoes of the historic rescue efforts from the Gulf Coast were published (some of them are posted in this blog post) and a huge number these pictures included pit bull-like dogs. The experience of working with the dogs, the stories about the rescue efforts,and the images started to change the attitudes of people WITHIN animal welfare about pit bulls. And this change in attitudes among animal welfare groups led to some significant changes in the years that followed. 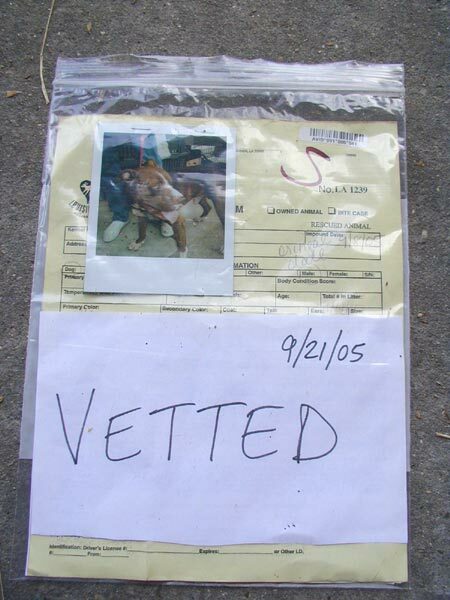 Two years later, in an historic case, a judge allowed the dogs seized from Mike Vick's dog fighting operation the opportunity to be evaluated and adopted out. While this was through a lot of work by some key folks working directly with authorities in this case, I don't think that it's any coincidence that for the first time ever dogs from a fighting case were allowed to live when now, it wasn't just "pit bull people" fighting for the dogs, it was the entire animal welfare community. 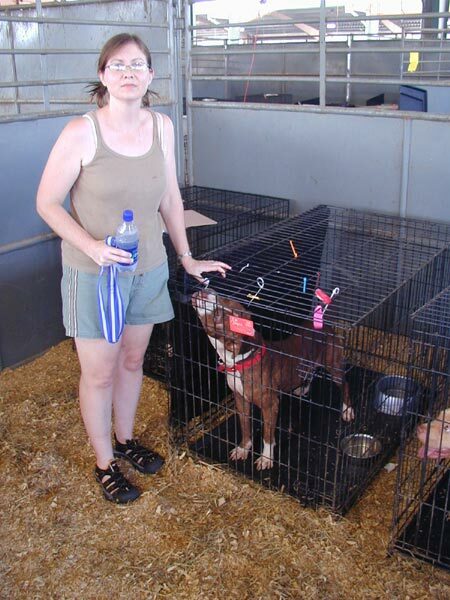 It was the animal welfare community again that put HSUS on blast after HSUS supported the killing of 127 pit bulls that were seized from a potential dog fighting ring in Wilkes County, NC in 2009 -- and the animal welfare community began to bring some of the national animal welfare groups along with them on their improved attitudes about pit bulls. 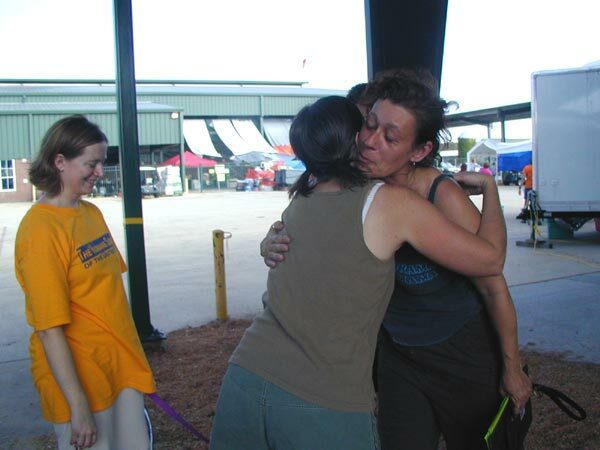 Best Friends Animal Society was relatively quiet on the topic of pit bulls prior to Katrina. 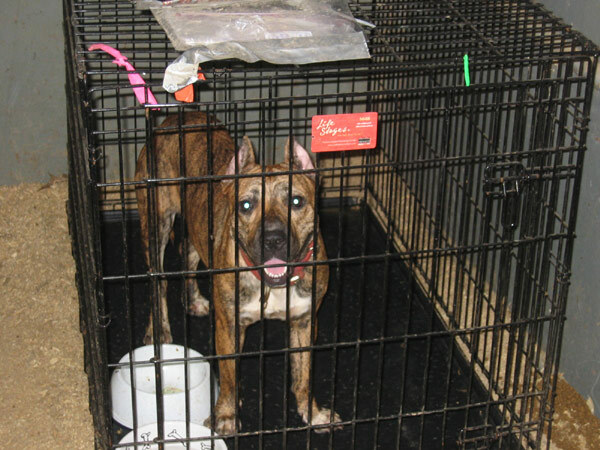 But following their experience at their own temporary shelter in Tylertown, they took an active role in helping many of the dogs from the Vick case and have become the most active national organization in affecting policy toward pit bulls in the years since. 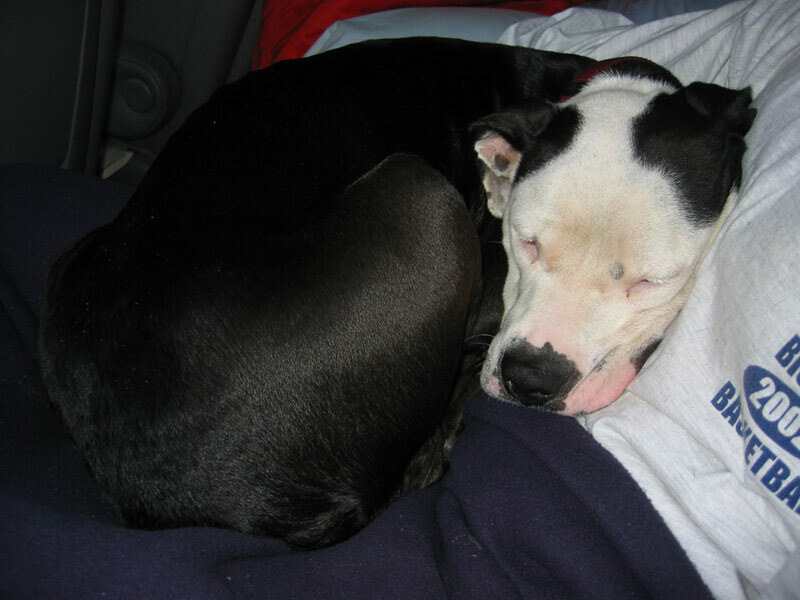 In the time that has followed, the attitudes have continued to improve and progress is being made for pit bulls. Long-time anti-pit bull people were forced out of high-profile positions because of their insistence on killing the dogs. Ohio, which was the only state to have state-wide breed-specific laws, repealed it's breed-specific law. 19 states now prohibit breed-discrimination from government entities. And now, many, many communities, like here in Kansas City, shelters have not only begun giving pit bulls a chance to be adopted, but adopters, and volunteers are falling in love with the dogs -- because, the dogs are....amazing. And it's with that experience with the dogs that more lives and attitudes will continue to change....for the better. 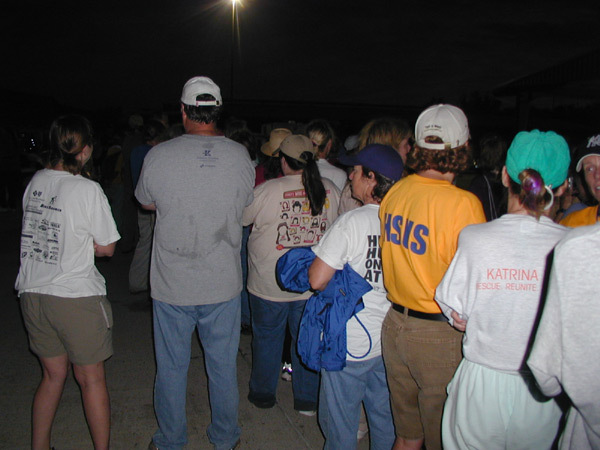 Over the past couple of weeks, I've taken the moment on the 10th anniversary of Hurricane Katrina hitting the Gulf Coast to look back at what it was like to be there in the weeks that followed, as well as the things that stick in my mind 10 years later from the week we were there helping the animals. 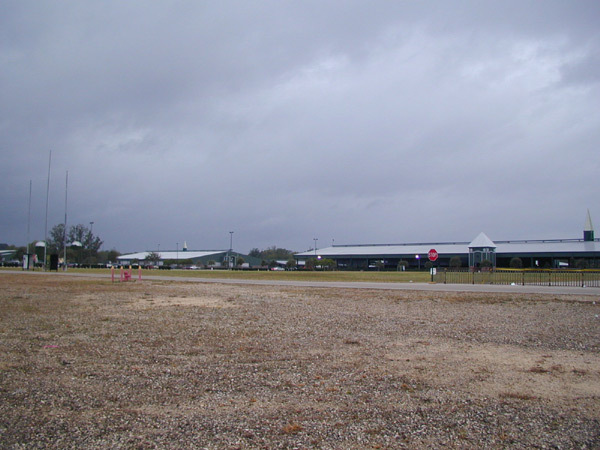 While the devastation to the communities in the Gulf Coast was obvious, and the impact to both human and animal lives was critical, in the months and years that have followed, some positive changes have resulted in the aftermath of Hurricane Katrina. The first and most obvious impact was the passage of the Pets Evacuation & Transportation Standards Act -- or better known as the PETS Act. 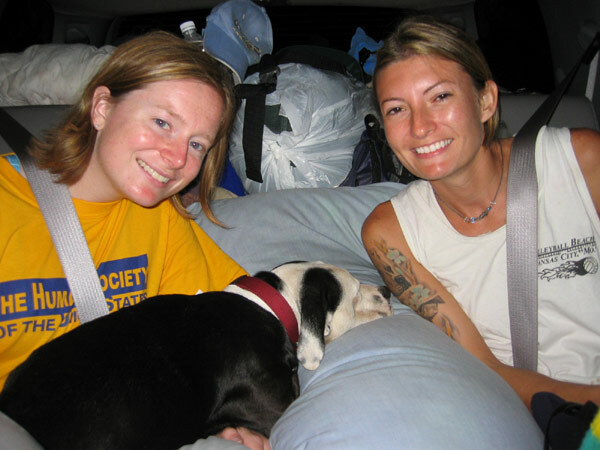 According to many reports, nearly half of the people who stayed in New Orleans during Hurricane Katrina to weather the storm stayed because of their pets. Pets weren't allowed on evacuation buses, and either people were forced to leave their pets behind (which many did) or stay behind with their pets (which many also did). The aftermath of the decision to not include pets in evacuation efforts was extremely costly -- many people who stayed behind with their pets died. Many others needed rescue. Pets that were left behind ended up being left for weeks because people were unable to come back to their homes -- leading to one of the largest animal rescue efforts in history. Stories from the Gulf area about people and their pets were heartbreaking. One story that emerged was about Morgan LaFaye, who stayed with his one year old, Apricot-colored poodle name Miss Morgan. LaFaye, a military veteran, was in a wheel chair after having lost both of his legs to diabetes but when his home began filling with water, he put his dog on the roof of his house and held onto a nearby tree for 14 hours weathering the storm. When the Coast Guard arrived, they rescued LaFaye, but refused to help Miss Morgan (Miss Morgan and LaFaye were reunited later after Miss Morgan spent 12 days on that rooftop). Another story really hit home when images emerged of a 9 year old boy crying because he was not allowed to take his little white dog, Snowball. The story of Snowball became the iconic story of the people and their pets that were separated from the evacuation efforts. "The story of a young boy who was so distraught at having to leave his dog, Snowball, when he boarded an evacuation bus became emblematic of the disconnect between how regular folks defined their family and how state and federal agencies defined a family." -- Francis Battista, Best Friends Animal Society in an article on CNN. Indeed, according to a 2011 Harris Poll, 91% of pet owners consider their pets to be part of the family. 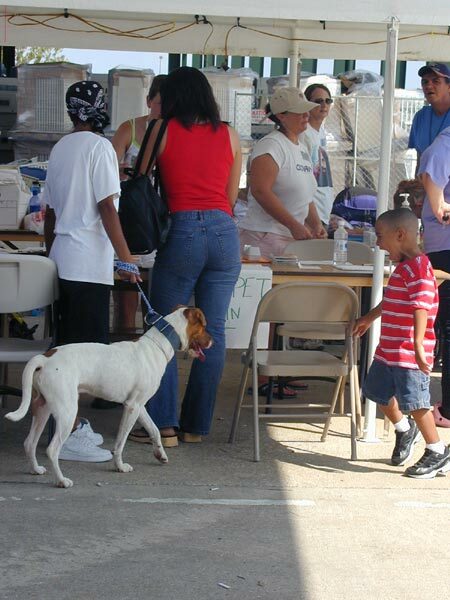 In the months following the Hurricane Katrina, public officials began to recognized the impact of pets as part of the family with the creation of the PETS Act. The PETS Act requires that the Federal Emergency Management Agency (FEMA) must accommodate pets and service animals in their emergency evacuation plans. 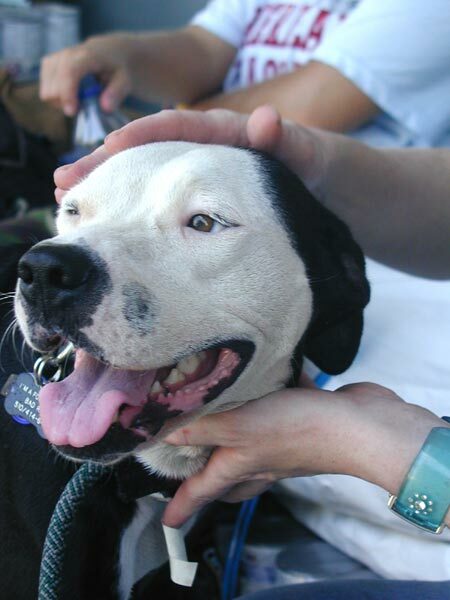 On May 22, 2006, just 9 months after Katrina hit the Gulf Coast, the House of Representatives voted to approve the PETS Act with 93% of the vote -- and the bill was signed into law in October 2006. I hope that the PETS Act is not needed again in this country -- and certainly not on as large of a scale as would have been required by Hurricane Katrina. But in so many ways, the PETS Act formalized the long-running trend in this country that pets are bonded to their owners like family -- and it is a bond that governments officials, and animal welfare activists should strive to not break apart. For more, an amazing article by David Grimm on BuzzFeed. Photos from this article on MSN. The memory is an interesting thing. It doesn't remember everything fully. Or always correctly. And often, the events that have happened since the memory creates a lens that molds and shapes that memory into something else entirely. And yet, memories are often very important because in so many ways they define us -- who we are, and what we've become. 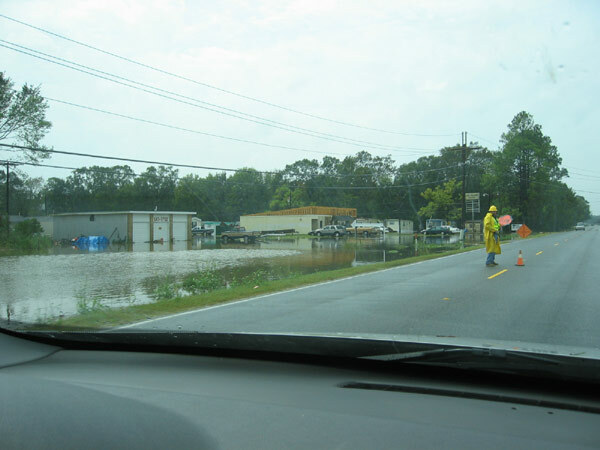 All of the 10-year anniversary specials about Hurricane Katrina have me looking back at my time in Gonzales following the hurricane a lot of memories come back. Some are foggy, and some forever emblazed in my memory. And most are better defined by how the memory made me feel than what actually happened. In 2006, I was a newby to animal welfare. I had adopted a couple of dogs. I had helped out with a couple of adoption events for our local rescue. But I wasn't someone highly involved. I, like most Americans, watched the devastation on the news. Seeing people starving, dying in the New Orleans Convention Center hit me particularly hard, as just two months prior I was at a convention there and that same hotel lobby was full of fun and networking at our event. 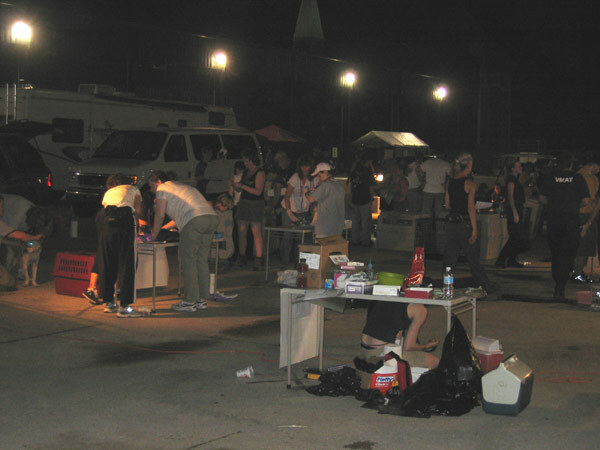 One night shortly after Katrina hit,our friend Melissa called us. She had a friend that was boots on the ground helping after Katrina and that they needed more hands, more help, caring for the animals. 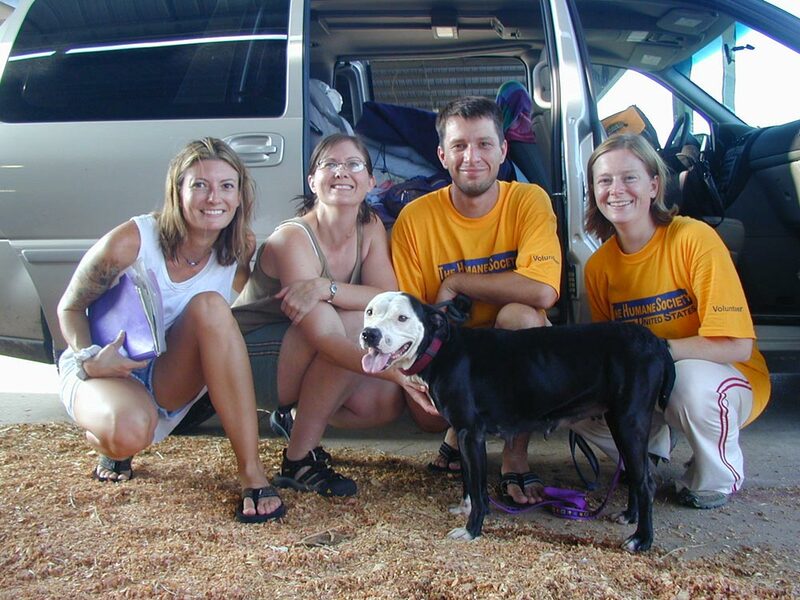 We weren't really needed to go into the city on boats to save animals from their situation (although we were certainly welcome to help), they just needed people who weren't scared of the dogs, most of which were pit bulls, to help care for the ones at the temporary shelter. 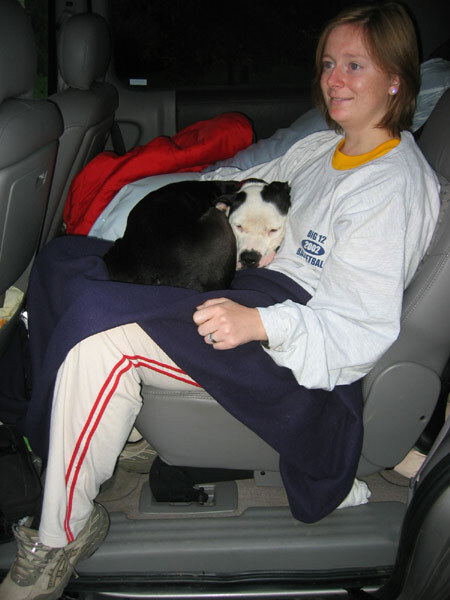 While I would not have considered myself an expert handler at the time, I certainly wasn't scared of pit bulls -- and at my wife Michelle's urging, four of us packed up and headed south. My first real memory of the trip is that I remember waking up when we stopped for gas somewhere in southern Mississippi. The entire gas station was covered -- and I mean COVERED - in boxelder bugs.Every single surface was covered. Is this because of the hurricane? Or because of the nearby pine forests? I still don't know. But what are we getting ourselves into? 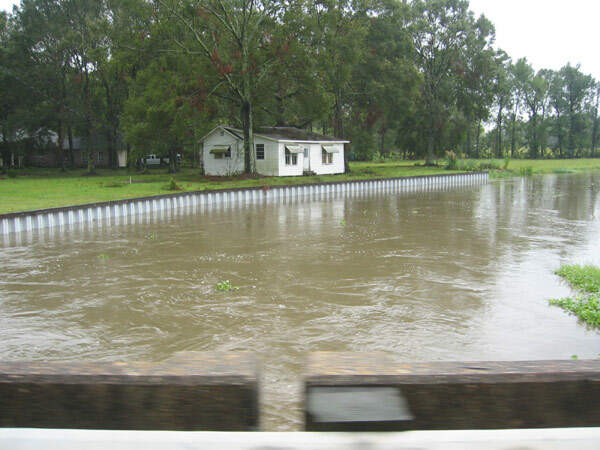 Just south of Baton Rouge the reality of what we were doing really sunk in. 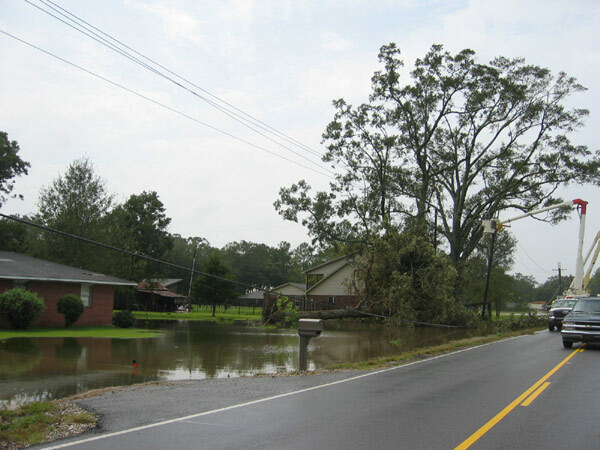 We had been hearing about the impending approach to Hurricane Rita and people were not going back to New Orleans and more people were leaving. 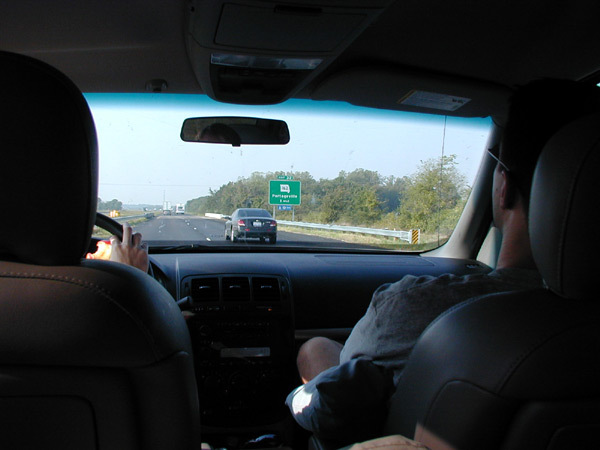 However, on our drive from Baton Rouge, everyone was heading North. It was bumper-to-bumper, including a lot of utility trucks that had come down to help restore power after Katrina. It seemed that everyone was heading away from New Orleans. Except us. We pulled into the shelter set up at Lamar Dixon in Gonzalez. 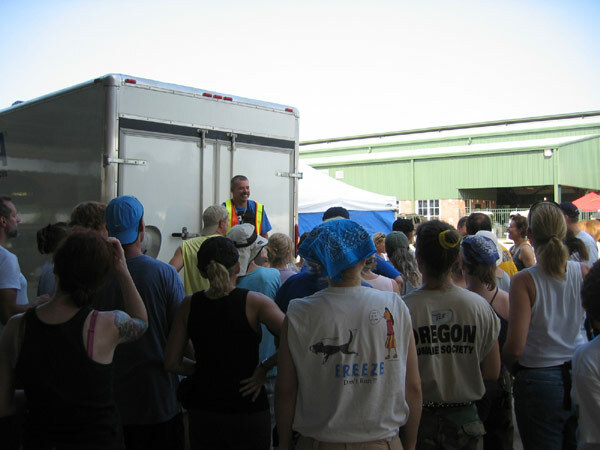 They were going to begin loading dogs, in kennels, into the back of a semi to take them to a nearby prison program so they would be safely out of the temporary shelter when the next storm hit. I hope that that is where those dogs went. I remember meeting the dogs the first day. They weren't all pit bulls, but probably 80% of them were. I took them out of the kennels and took them for a quick run to a fenced in area designated for potty breaks. I ran with them a lot -- for about 15 hours or so every day while we were there. The dogs themselves -- were amazing. I couldn't believe how good all of the dogs were. They were happy to see you every time you came by. They loved to play and the interaction. Many were crate trained. These were clearly people's pets. Would they ever be able to find their people? 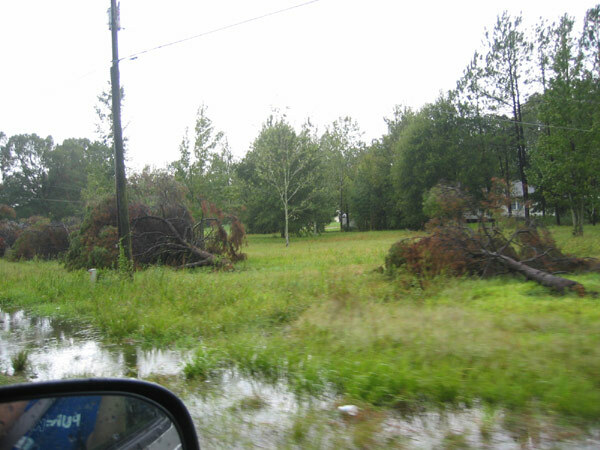 Hurricane Rita was coming. I had always thought of hurricanes as one big storm. However, I learned that on the outskirts of hurricanes there end up usually being hundreds of smaller tornadoes that emerge from the storm. 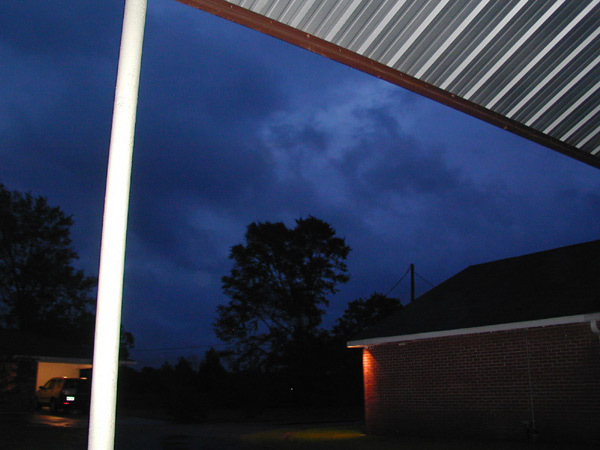 We have to stop our work to take shelter due to some of the tornadoes on the front end of the storm. A lot of people were freaking out over the tornadoes. I'm less concerned at this point. I guess being from the Midwest gives me that advantage - -we call this May & June in Kansas City. Finally, the heart of the storm is near and we are told to evacuate. They have buses taking people to a couple of shelters -- people can also drive themselves to a church that has opened itself up for people. "Don't get on the bus -- go to the church" someone tells me. "You don't want to lose control of when you can and can't come back." Sound advice it seems, so we go to the church. For nearly 24 hours we stayed at the church where they had cots set up. We were on the main floor of the church - they don't build basements much in New Orleans because they'd always flood. That's different than in KC. I get a phone call from a co-worker. "You still there?" Yes, yes of course. "There's another hurricane coming." Yes. We've taken cover. We're just waiting out the storm. "Be safe. And if you need help, call, we'll send the company plane to get you, just don't get stuck down there. If you need help, call." We have a car and a full tank of gas. We'll be ok. But what are they saying on the news? How bad is this hurricane? What are we in for? We met a lot of people - and had a lot of time to talk to them at the church. Overall, the people that came to Louisiana following the hurricane were amazing. They were genuine. People came from around the country to help. Some hopped on planes, or in their cars, and came thousands of miles by themselves to help out. I'm sure I would not have come if I had come by myself. We met a lot of great people on this trip -- most of whom I haven't ever seen or spoken to again. If only social media had existed in 2006. I woke up the next day and most of the storm had passed. Others were asleep. We hadn't been given the all clear to leave yet, so I go outside. The storm had dropped a lot of water. And there were a lot of downed tree branches. I just begin picking up downed branches. There was something eerily soothing about the clouds, the calm after the storm. No cars. No noise. I made a big pile of branches that the church would now have to deal with, but at least they didn't have to gather them up. We finally get the ok to head back to Lamar Dixon. I remember the sense of urgency we felt in needing to get the dogs out, and fed. It was never really clear if anyone had been with them for the past 24 hours. There weren't very many of us at first, but gradually, people started coming back. How hard people worked was amazing. Much of the rest of the time was spent with the dogs. We all began to grow connections to our favorites. I had a beautiful brindle pup with cropped ears that was super-high energy. Another that was a gold-colored brindle that almost looked like a she was tiger-striped. 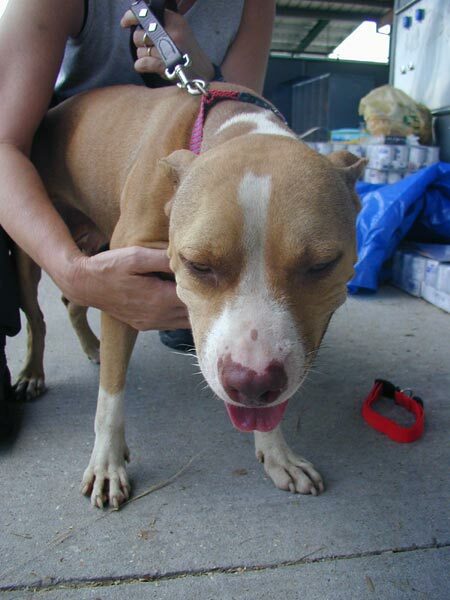 Melissa had a favorite that was a fawn pit bull with an unusual bark that sounded like a smoker's bark. Running dogs. 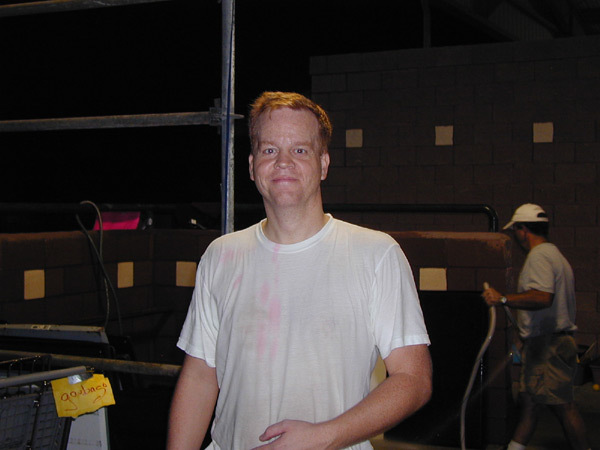 Cleaning kennels. Repeat. After the storm, more people started to come back into the city to try to reunite with their lost pets. People would wander up and down the isles looking for their pets. 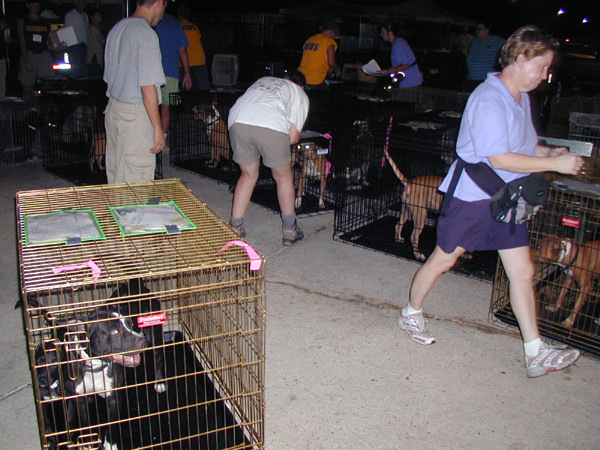 By this time, we had nearly 1,000 dogs on-site - and some people had already been to Tylertown or some of the other staging areas. 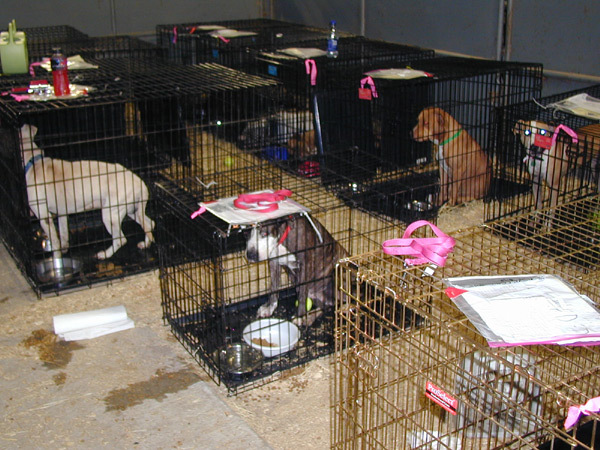 It was devastating so see the looks on people's faces when they didn't find their pets. Really, 1,000 pets here, and none were theirs? They were devastated. I can't imagine the feeling of leaving your pet behind thinking you'd be gone for a few days to realize it was weeks before you could came back. It would be hard to handle. And many people were heartbroken. While the number of disappointments outnumbered the number of families that were reunited, I will never, ever, forget seeing the people reunite with their pets. Their excitement. Their joy. And dogs who seemed just as overjoyed. It was moments like the one pictured here that made the gravity of the situation, and the heartbreak feel worth it. We set up our tents to camp. 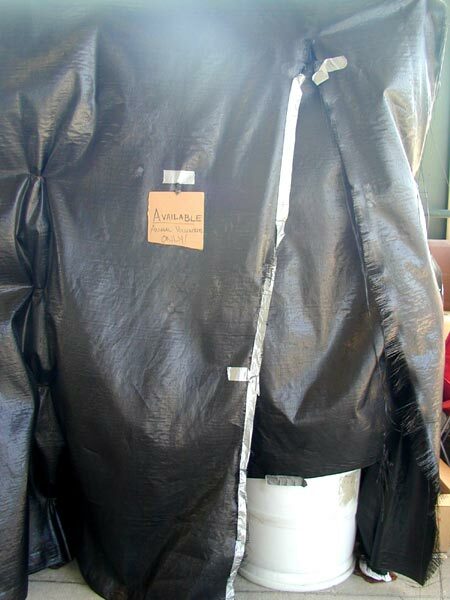 Not nearly as comfortable as the large tent that was there before Rita came through. But there was privacy, so there was that. 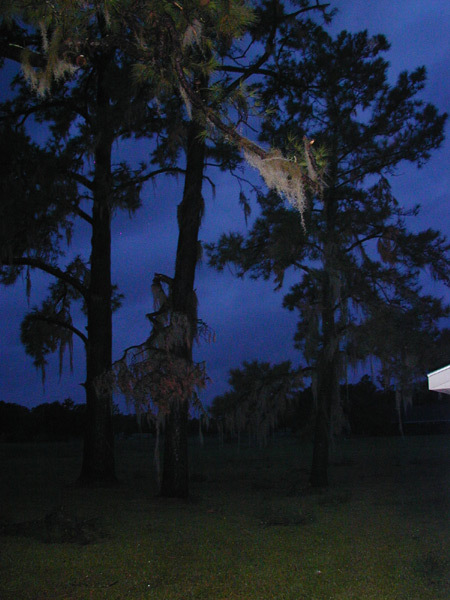 Although setting up in the dark can have some disadvantages -- beware of fire ants. One night they ordered pizza for all of the workers. Papa Johns maybe? I can't remember. It didn't matter -- I'd never been so happy to see pizza in my life. People near me were complaining the pizza wasn't vegan. Really? I'm sure the number of vegan options here were limited before the area got ravaged by two hurricanes. Be grateful. I'm grateful that dinner is going to be more substantial than a granola bar. Our time has ended. It seems like too soon. In some ways it feels like we've only been here a few hours, and in some ways it feels like we've been here for a month. In reality, it's been about 6 days and we're all due back at our office jobs. We are going to bring back a couple of dogs for the rescue we're with. It's a tough choice. We have room for two pups -- and with 1,000 to choose from, how do you decide? We pick our pups - we name them Nola and Dixon. We also go through and take note of some of our other favorites that we're going to try to get later. We say our goodbyes and head home. 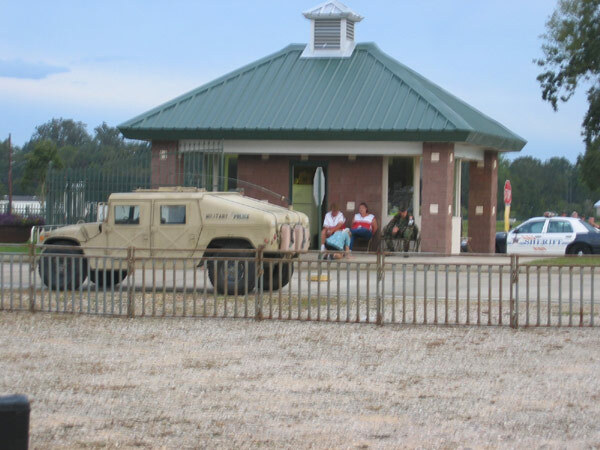 It wasn't long after we left Gonzales that they started to break up the Lamar Dixon staging area. 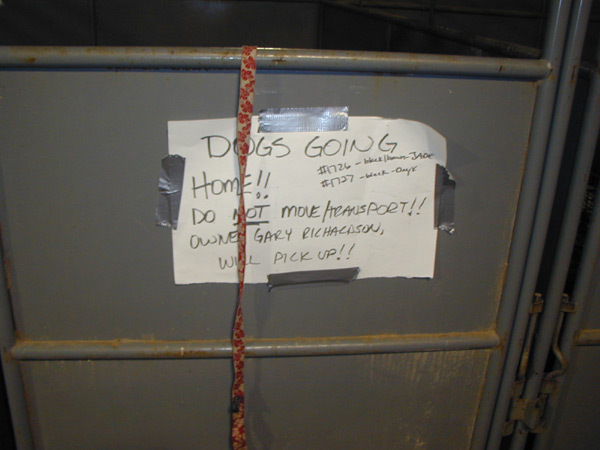 Dogs were shipped to various shelters and rescues across the country. Lamar Dixon was eventually closed to dogs and resuming its original purpose as a horse shelter. We starting making attempts to track down some of the dogs who we'd bonded with. Some we were able to track to various shelters across the country. A few just seemed to disappear, as if they'd never existed. Of the dogs that we tracked to individual shelters, all were put down by the shelter after their mandated hold period was up. 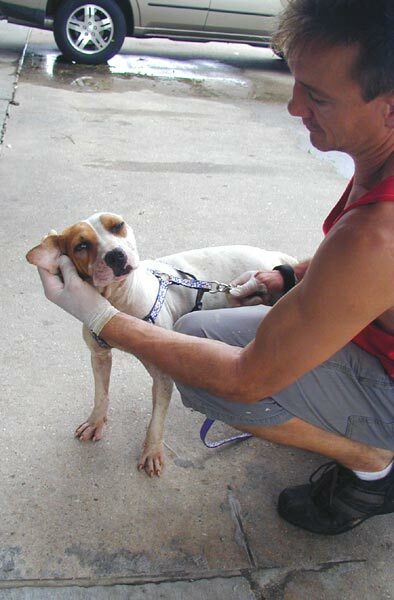 Several shelters I know of made no attempt to adopt out the dogs they got from Katrina -- they simply held them until their hold was up, and then killed them. I felt betrayed. 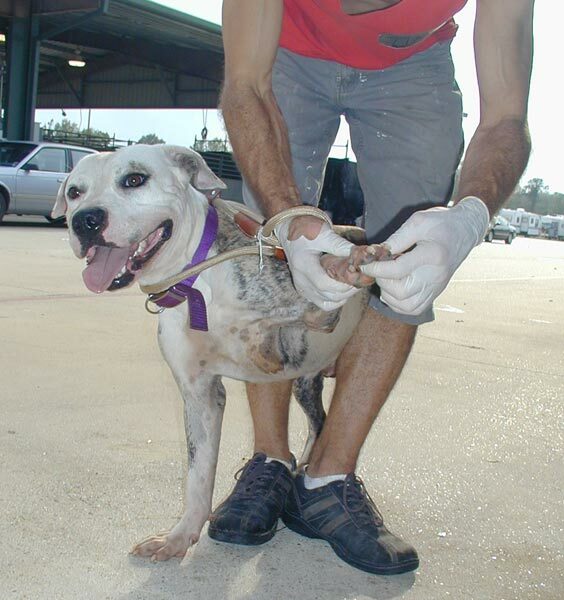 How could so many people put in so much time in the conditions surrounding Katrina helping these dogs, only to have shelters simply kill them at their first opportunity? How does that happen? Some said it was because they were pit bulls and thus "unadoptable". 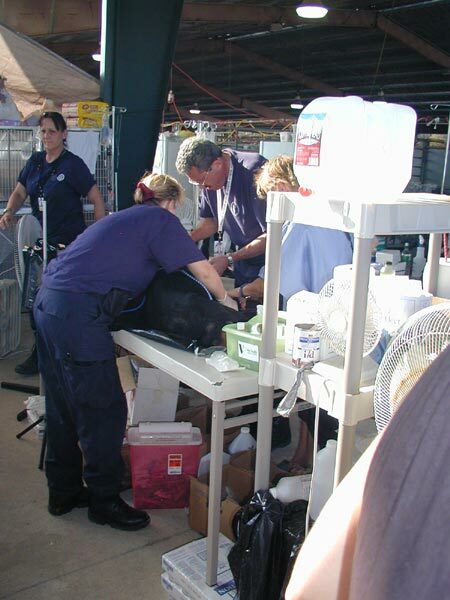 Many of the dogs suffered from heart worms and may have been killed due to "health". 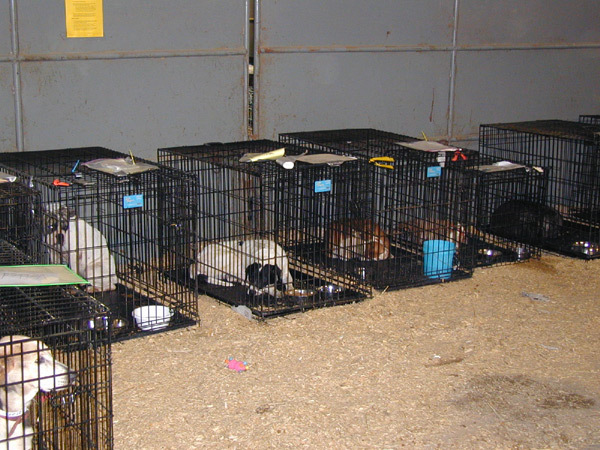 Others, simply because the dogs were no longer profitable for the shelters and it was time to move on. For all of the good that happened down there, it's hard to let that feeling of betrayal go. The system was broken. I knew the system was broken, but not like this. This wasn't just city shelters beyond capacity that couldn't help. 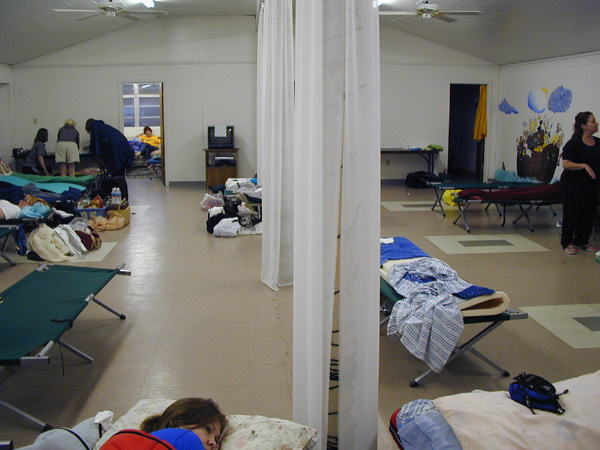 Some of these shelters were private shelters -- and some were VERY well-funded shelters. I was stunned. And sad. While I'm sure a lot of these dogs were able to find great homes, including one of our dogs Dixon, many were not given that same opportunity. 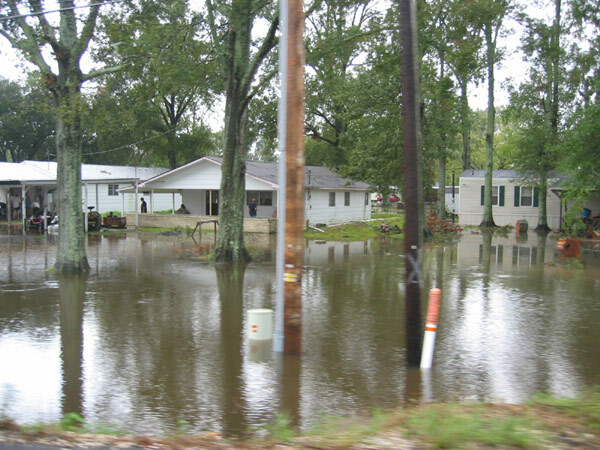 In the 10 years since Hurricane Katrina, much has changed. I think for as much as the Hurricane revealed how as a nation we responded poorly to the human crisis in the area, it also revealed gaping holes in the animal welfare side as well. Some of those gaps have been filled. Some are still being filled. But I think how we view pets as family has changed since Katrina. 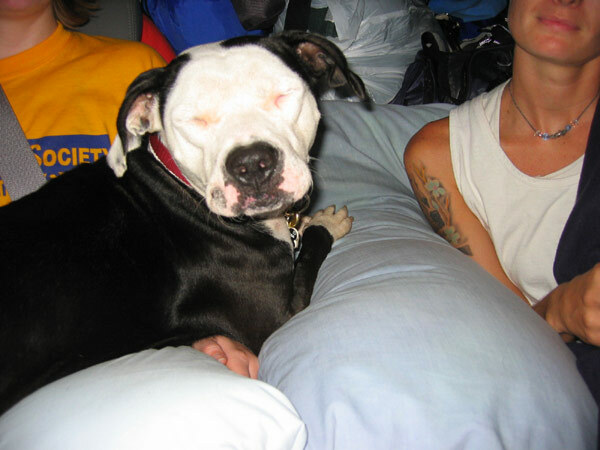 How we view pit bulls has changed since Katrina. 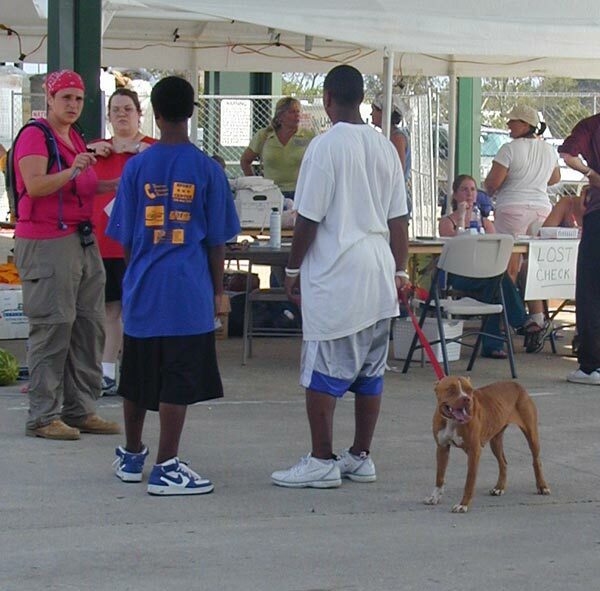 And the responsibility shelters feel to save these animals has largely changed since Katrina. We're not there yet....but public opinion is forcing these changes for the better. Our two dogs Dixon and Nola ended up with very different results. 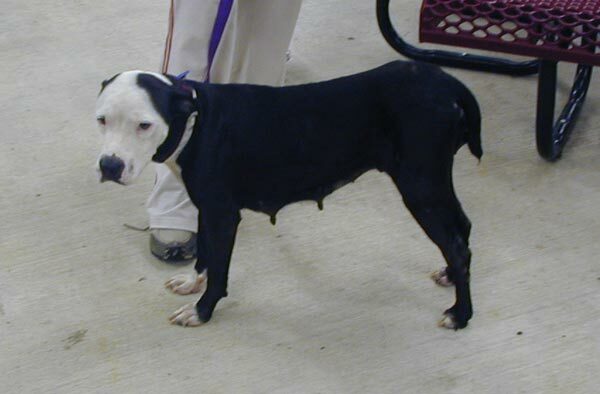 Nola died during her spay surgery. Dixon was adopted into a fantastic family and lived in Kansas City and Phoenix for 8 years before passing away due to kidney disease. He had a really great life. This week marks the 10th Anniversary of Hurricane Katrina hitting New Orleans, devastating a city and breaking apart a community. 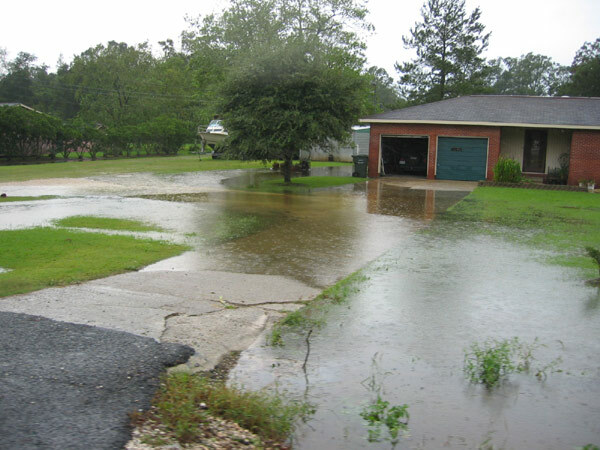 There are no shortage of odes to Katrina this week, or this month. And I'm sure many more will follow. And maybe by writing some of the parts of this series I may not be doing it for anyone's benefit other than my own. But Hurricane Katrina changed New Orleans. And Hurricane Katrina changed me. So for the next week or so I'm going to share a few thoughts on the experience. 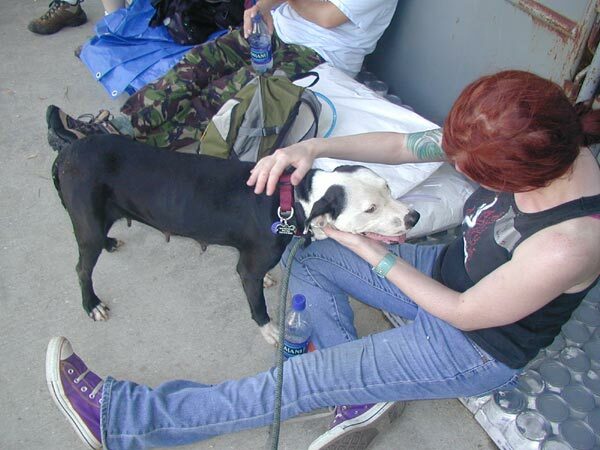 10 years sure has allowed me more opportunity to put my time in New Orleans in perspective -- for not only how it changed me personally, but how it changed welfare for animals in this country. Yes, I'll talk about the rescue efforts, and the friends, and the lives saved, and the lives lost. And yes, there is the PETS Act, a lasting sign of the importance of pets to people. But there is more. Today I'm going to start with my trip diary. These words were written in the weeks following our trip to help with rescue efforts in Gonzales following the Hurricane. I haven't read this in years, and thankful for the Google Wayback machine for helping me find them in their original form. The following are my most memorable events from our trip. This was all done in retrospect, so some details may be filled in as best I can. My goal is to give you an idea of not only what things were like in Gonzales, but also how it felt to be there. The people there were amazing. The animals were even more amazing. There was happiness, and sadness. Someone asked me today whether or not we had a good time. I don't know how to answer that. Yes? No? I simply told them I was really glad I went. It would take me hours to answer the question. Hopefully they'll get a chance to read this. Wednesday, Sept 21- We have no idea what to pack. Information of what our environment will be like is in short supply. Some reports say to bring a tent. Some say they will provide shelter. We get varying reports on food and water. There's another hurricane (Rita) coming. Not sure where that is going to hit either. I've never been on a trip before with so little information about what would be ahead of me on the trip. But we're going. And we'repacking everything. Tent. Food. Bedding. We're preparing to be prepared. This will be an adventure. Thursday, Sept 22 6:00 - We arrive. The tension is really high. At first, I'm not sure whether it's my personal tension, or whether it's the tension at Lamar-Dixon - an equine center just outside of Gonzales , LA (about 25 miles south of Baton Rouge ). We have no idea what we're getting into. What are we going to do? How can we best help? And what is up with this hurricane? For the last 2 hours we've been in minimal traffic in our lane - with bumper-to-bumper traffic heading the opposite direction. They're all evacuating from the incoming hurricane. We're going the other direction. When we get there, the other workers at Lamar-Dixon were stressed too. You could tell they held the same uncertainty of what was to follow. How bad would the weather get? Would we need to evacuate? Would we need to evacuate the dogs? No one was certain. In the first 3 hours we were there, the word on what would happen changed several times.We're given instructions to go to the volunteer tent and claim our cots, then come back to help. So we're off to the tent. The volunteer tent is a huge, white tent that is lined with cots - over 300 of them. After a little looking, we found four cotsand with a little manipulation, we were able to get them side-by-side. 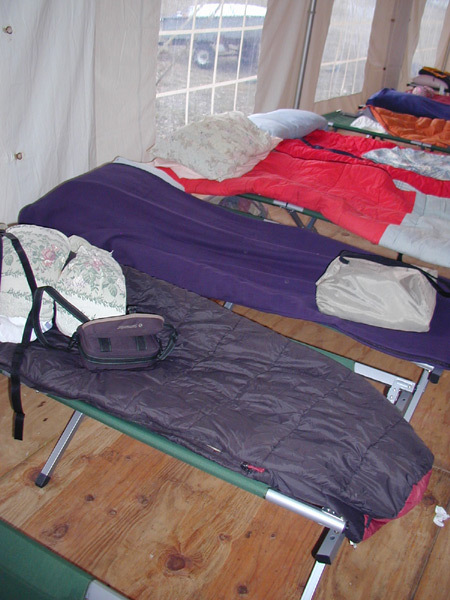 We set all of our bedding on the cots, and like the others before us, we put our clothes and supplies underneath. Off to the kennels. 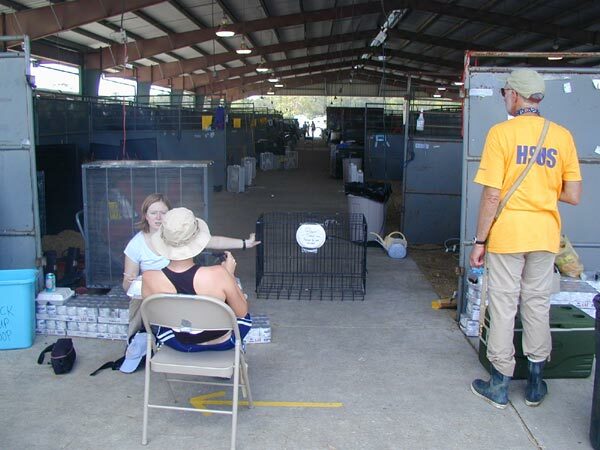 We get back to the kennels (about a ¼ mile from the tent) just in time for a meeting. 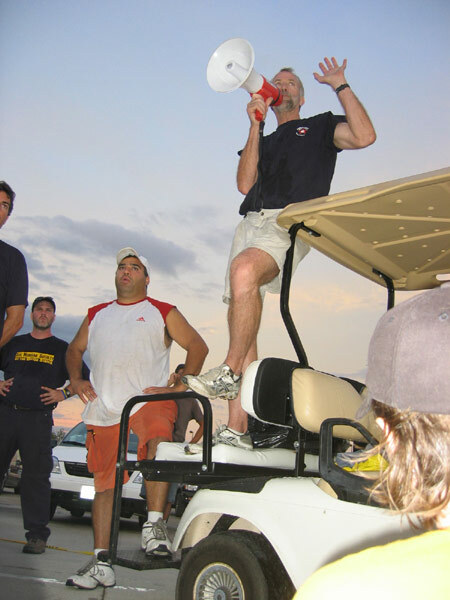 Through a megaphone, all 200 volunteers are given instructions. 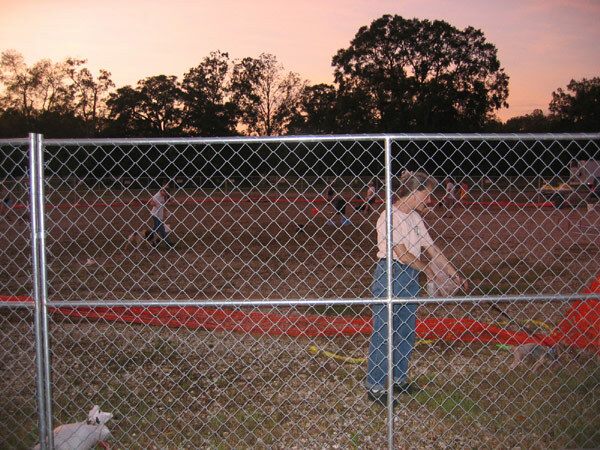 We're getting the kennels ready for the hurricane. About 150 dogs are getting shipped out -where they are safe from the storm - fortunately they will all be part of a prison-adoption program at the prison facility in Jackson, MS. These dogs will be adopted by prisoners. This is a first in this area, but these programs have been very successful in other areas. The dogs get a caring owner, the prisoners learn responsibility. We are going to be allowed to stay in the volunteer tent tonight, but it will be taken down after tonight for the hurricane. Don't know what tomorrow night holds, but there's work to do tonight. We're assigned to Barn 5. The barns are basically covered horse stalls that are open on all sides. 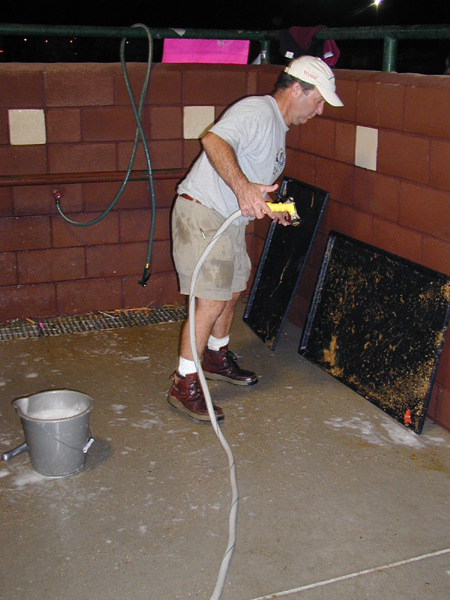 Our objective is to get everything that is being stored outside of the barn or in the outside stalls into the inside of the barn. The plan is to get everything that will blow around during a windstorm tied down. They're going to bring RVs and semis in to surround the barns to block the wind. I'm impressed with how much thought they've given to this. Our group works on taking down protective fencing, and moving food/water bowls to the inside of the barn. Allfood and water bowls are washed after every feeding. Some of the dogs are ill - and they don't want to cross-contaminate the dogs. 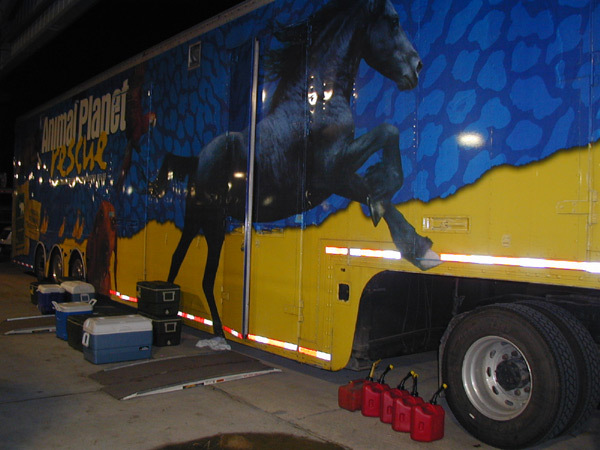 We move a lot of other things to the inside stalls. We work until almost 2 am. We're off to bed. I wake up a few times due to the heavy winds, but the weather is holding nicely so far. Friday, Sept 23 We're up and at 'em by 7:30. We need to feed and water the dogs first thing in the morning. There are about 1200 dogs and cats in five barns. About 75% are Pit Bulls. That's a lot of food and water. We work in teams of two. 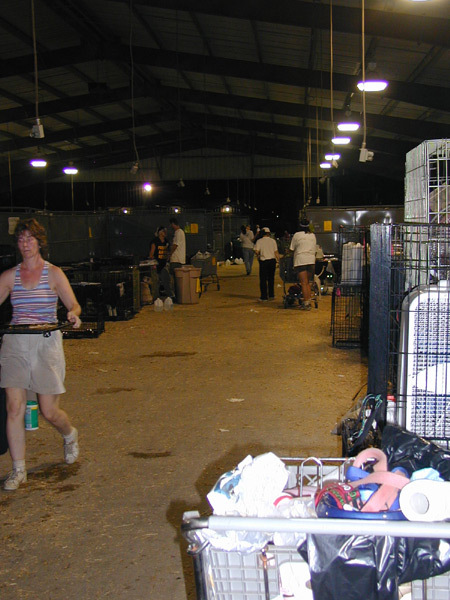 One person takes the dog out for a walk (poop, pee, etc) while the other cleans out the cage (many of the dogs were not kennel trained or had to be in their kennel so long they could not hold it), and provides food and water. 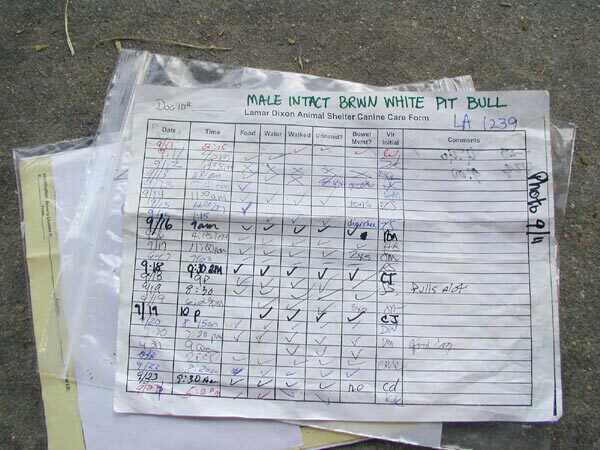 Finally, one of the volunteers then fill out the log, making notes of if the dog pottied, ate, or got walked. 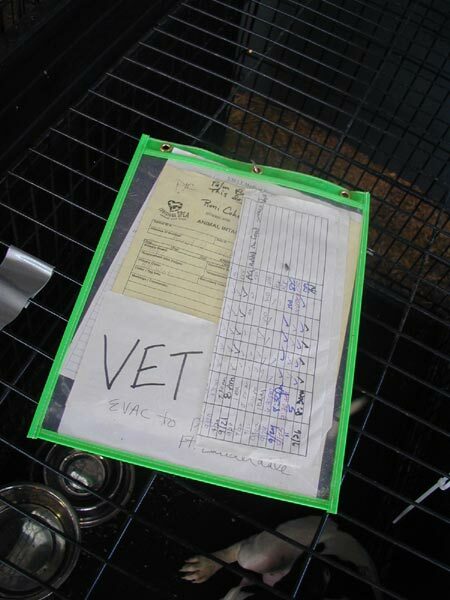 The log is affixed to the top of the crate in a plastic bag with all of the paperwork that show the dog's intake photo, microchip number, and pertinent vetting information. Many volunteers have left because of the storm, so we're a little short handed. 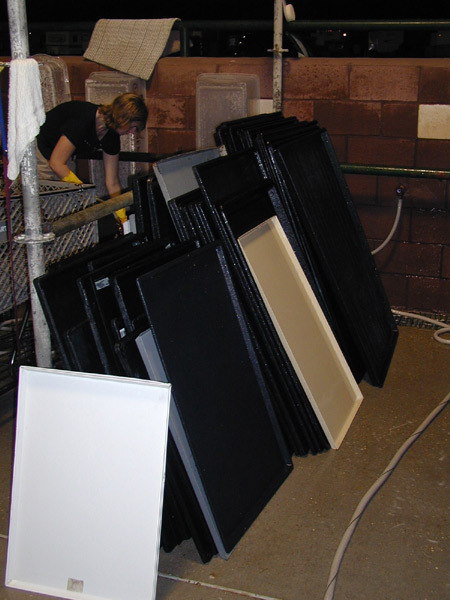 It takes a long time to clean the cages of 1200 dogs. We finally finish up around 2:00. It takes a little longer than most days. On three different occasions our barn manager lets out three sharp whistles and shouts through a bullhorn for us to take cover in concrete bathrooms because of tornado warnings in the area. Apparently the areas in green on TV screens that surround the eyes of hurricanes are filled with mini-tornados. This is news to me - Midwesterners are pretty ignorant about hurricanes. I learned a lot while we talk in the bathroom with the locals. Apparently the tornados are part of the deal. It is already raining pretty hard at times... At 3:00 we are told that we will have to evacuate. Skeleton crews - 10 per barn - will stay behind to ride out the storm with the animals. We're given three different options. There is a shelter set up for us by FEMA. They will bus us there. The facility has showers. That's a plus. There is also room for 40 people at a local church. No showers, but we get to drive ourselves. The third option is to drive ourselves wherever we want to go. They recommend that hotels will be easiest to find in Birmingham or Jackson . Both are 4 hours or more away. We opt to stay at the church. The idea of leaving our car behind and putting our fate in the hands of FEMA doesn't seem appealing - we'd seen FEMA's work in New Orleans. 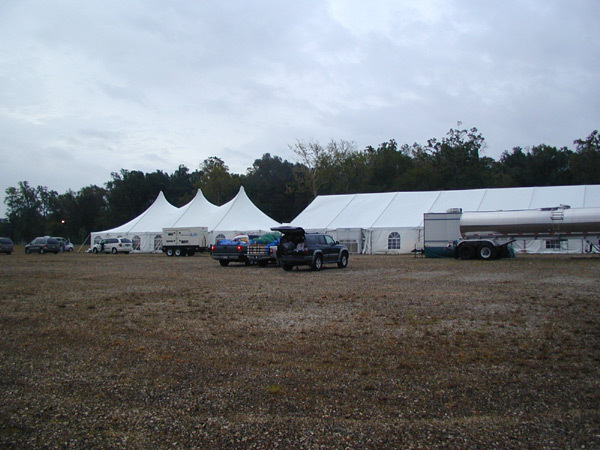 We use the temporary showers at Lamar-Dixon (shower heads put in horse washing stations surrounded by tarps) and then head out to the United Methodist Church in Gonzales. We stop at Taco Bell on the way - it might be our last hot meal in a while. The church is again full of cots, and the congregation has provided some basic food for us. They were very kind to take us in. At the church, we start talking with the others who opted to stay there. They are jealous of our showers. All are eager to get back to the kennels. We hope the storm isn't as bad as it is supposed to be. One of the people at the church has a portable TV, so we watch the storm coverage. The storm is moving north more than they thought - but is losing power because part of the storm was over southern Louisiana. We're not really sure what that means for us. Is it going to be better? Or worse? We're told to use towels the pastor provided to soak up any water that comes in through the church doors over the night. At 10:00, it's lights out. We're really tired, so sleeping is easy minus a few snorers in the group. Saturday, Sept 24 at 7:00 - I'm wide awake. I go outside to have a look. We've clearly gotten a lot of rain (in fact, it's still raining). There are a lot of tree limbs down, a few trees are blown over, and standing wateraround, but it appears that we've survived the worst of the storm. I go in and get a little more shut-eye. After more talking in the church, a few of us go out and pick up some of the tree branches out of the church lawn. It's the least we can do for them. Around 11:30, someone from the HSUS comes by and tells us we are going to be accepted back at the shelter. 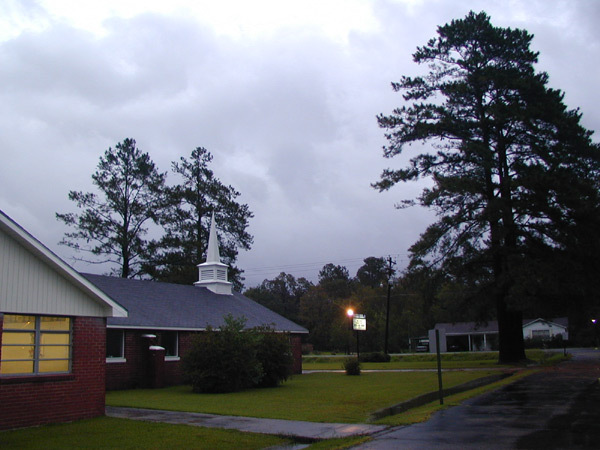 It will only be the volunteers from the church location - the FEMA shelter won't come back because the weather is still threatening enough to keep them from transporting those volunteers back. We made a great choice on where to stay. We pack up and head out. We're back at the shelter by 2:00. Michelle and I show up in Barn 2 - we were reassigned. The Barn manager is SO happy to see us. No one there has slept much and they're very short handed. Many of the dogs are still lying in their own feces from the night before. 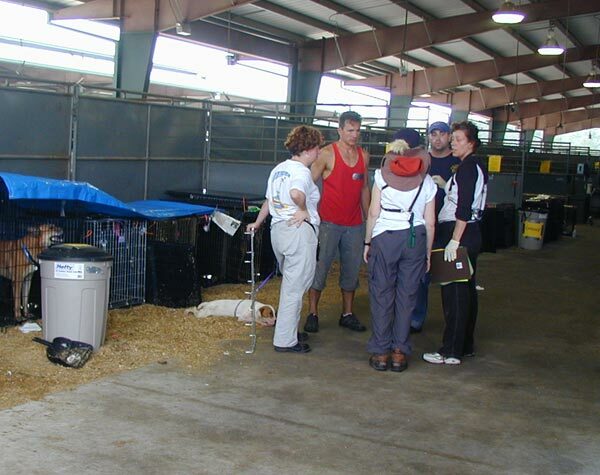 It takes a lot of volunteers to take care of that many animals. We instantly get to work with our still skeleton crew (although nearly double the crews that were there) and start cleaning cages and feeding/wateringthe animals. We can't take them for good walks yet - it's still not safe to get them far away from the barns - but at least they will be cleaned and fed. Melissa and Abby get assigned to Barn 5 again, where they again meet up with BadRap volunteers (two of who weathered the hurricane in the barn on the skeleton crew the night before) and start cleaning kennels and feeding/watering dogs. At one point, they get to watch BadRap perform a temperament test on a possible pit/American Bulldog mix, and they get to see a few lucky dogs who have already been tested go to a rescue arranged through their group. Michelle and I get asked to stay through the night to keep watch on the animals. Apparently there have been some problems with people coming to the facilities and stealing the animals. I hate people sometimes. Michelle and I jump on the opportunity - they need the help and honestly, we don't know where we'll stay tonight if we have to evacuate the property again. This will solve that problem. We finish up late again. Midnight. A friend who we've met over the past 2 days, Arjian, has met some people who are going to be out tonight - so they have allowed us to sleep in their trailer. We accept the offer. We crawl in bed around 12:30. Our Night shift is from 5am - 7am. It's going to be a short night. Sunday, Sept 25 - the 5-7 shift is pretty uneventful. There are a lot of people around - they're sending crews back into the city to rescue more dogs today for the first time in several days. At 7:00, it's time for the morning food/water/walking. Michelle and I notice that a lot of the animals in our new shelter area are kennel-trained. Because there are no other volunteers around, Michelle and I work to take out all of the animals who haven't messed their cages before we clean and feed. It's extra work, but these poor animals! It is really sad because you realize they were someone's pet. someone is probably looking for them. 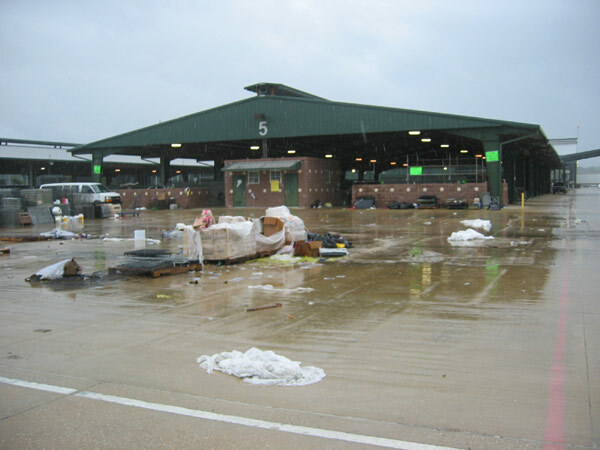 With five shelters around similar to this one, and with animals getting shipped out regularly, it must be impossible for owners to find their animals. It makes me sad. Many of them will never get back together. By 9:30 or so, we're almost back to a close-to-normal group of volunteers. Michelle and I are assistant barn managers and are helping the new volunteers learn what needs to be done and helping them out. There is a woman named Kelly in my group who has been there for several days. Kelly is probably 60 and just loves these animals. There is one puppy that is very sick. She is very concerned so we get a vet to come check her out. We're given some special food to help her digest better. Something new for me today. They are letting owners of lost dogs back in to look for their dogs. They are all coming through with special nametags looking. They all look so sad and frustrated. I try to talk to some of them. "What kind of dog are you looking for?" I ask. They vary in their responses. Two just start crying when I ask. I feel horrible for these people. One woman is looking for a Dachsund. I shake my head. I haven't seen one. They're not exactly the best swimmers. She starts to cry. She's the last person I ask. Meanwhile, Melissa and Abby are over in Barn 5 and right about the time that Melissa realizes she's not sure she can cope with saying goodbye to her special buckskin, bellyrub-loving boy tomorrow, Furry Friends Foundation shelter director Catherine shows up and distracts her, thankfully. They get through the rest of their shift -barely. Abby finally asks Melissa to go and get the ball rolling on what dogs we are going to take back with us to get her out of there. Abby stays back at Barn 5, finishing the dogs before she meets up with the BadRap gang, now being introduced to Furry Friends folks. We finally get done with the morning shift work. It's quiet time until 3:30. 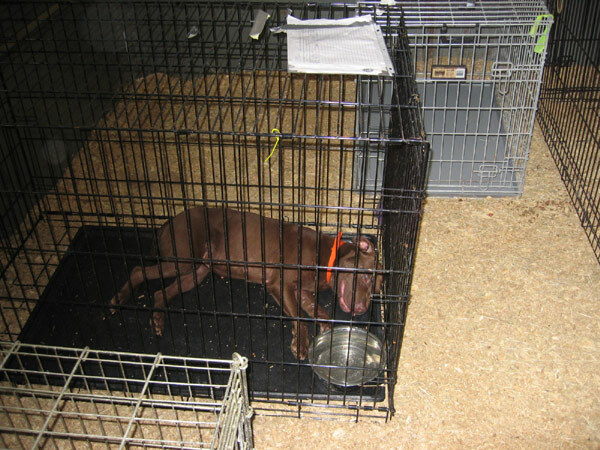 The dogs need their naps and don't sleep well with a lot of activity in the kennels. Kelly comes up to me - she has to go. The person she came with has to leave. I thank her for her help. She then tells me she doesn't want to go. The dogs need her. Her little buddy (the sick dog) needs her. I promise her I'll keep an eye on them. She cries. I hug her. I cry too. Leaving all of these animals behind is going to be really hard for me too - I'm now starting to realize that. My last day is tomorrow. Michelle and I are told to take a break after 3:00. We have been on for 10 hours solid, after a really long day yesterday. They are really concerned that tired workers make mistakes. We use the time to set up our tent. The volunteer tent hasn't been set back up yet, but the winds have died down enough that we can set up our little tent. We shower. Around 4:30 I go and check on my sick puppy. She is gone. The vets have come and gotten her. That's good - she needed the individual attention. I'll head over to the vet area tomorrow and check on her. The two of us, along with Abby, decide to head to town to get dinner. Melissa stays back to shower. She had a hard time today. After trying to stay relatively detached from all of the dogs she knew she wouldn't be able to take home, her buckskin male finally got to her. She knew she'd have to leave him behind and needed some time alone. They've been doing a great job of feeding us - but getting away would be nice. It's a Sunday night, and every restaurant in town is overflowing. It's a 25 minute wait at Chilis. The drive-through lines at Wendy's and McDonalds are huge. The population of Gonzales has nearly doubled in the last 3 weeks. Every hotel is full. One hotel has a sign on the door - No Vacancy until 12/30. There are thousands of evacuees from New Orleans staying in the city. Some are in area hotels. 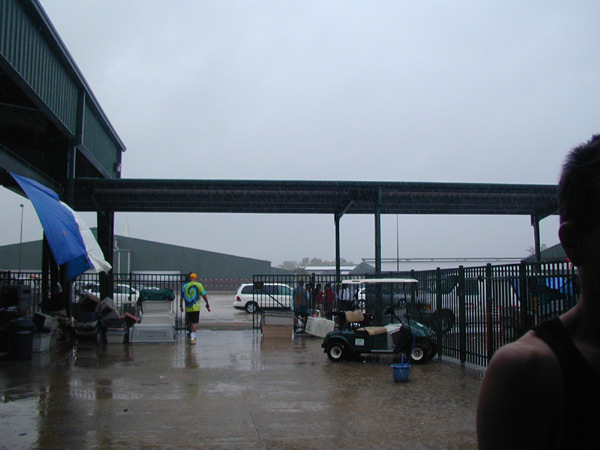 The area YMCA and 4-H building adjoining our barns has also been turned into a temporary shelter. There are also hundreds of volunteers in town on a regular basis trying to help out at Lamar-Dixon. Some may never go back. It's a strange feeling. After dinner at Taco Bell (who, due to shipping problem, was out of beef), we head back to Lamar-Dixon. We talk to some of the other volunteers. I check in the vet area for my puppy, I can't find her, but it's a busy time, so I'll follow up tomorrow. The crews that went into the city have come back with their animals and are checking them in. We watch in-take for a while. Many of them are in pretty bad shape, but they'll be much better taken care of here. It's getting late. Off to bed. It's an early morning again tomorrow. Monday, Sept 26 - up and at 'em early again. 6:30. Michelle and I are again asked to be assistant barn managers. I immediately resign my position today. Overnight, I decided that I want to spend my last day here with the animals. Being a manager doesn't allow me to walk the dogs. I can be middle management at home, so I step down. Per my new routine, I get out the kennel trained dogs first - I know who they are now. We run across the parking lot to the dog-walk area. They do their thing, we come back. I rave about how great of a job they do. Being kennel trained will help make them more adoptable. On our walk back, a beautiful brindle Pit jumps up and gives me a huge bear hug (ok, Pit Bull hug). He wraps his front paws all the way around my waist. Some other volunteer shoots a photo of it. If you were that guy outside Barn 2, please contact me, I'd love to have that picture. I can't believe how loving these animals are after all they've been through. This dog was my favorite. Another favorite of mine was a beautiful small, red Pit. He was VERY fun. Energetic. I don't think he's adoptable. Pretty dog aggressive. Probably bred to fight. But he and I became buds over the course of 3 days in Barn 2. We go for a walk too. We then go through our usual routine. I run with as many of the dogs as I can. Around lunchtime, my partner in dog cleaning, Rick, had some friends come by and see if he wanted to get lunch (provided by HSUS). Rick declines. "We're almost done." They insist that they may run out of food. Rick pipes back with a smile, "These dogs need food too, this is what I came down here to do." I can't mention enough how impressed I was with the majority of the volunteers. After my shift, I go to look for my sick puppy that I'm keeping an eye on for Kelly. I can't find her anywhere in the ER area. As it turns out, the dog was relocated to LSU's Veterinary school for further care. I don't know if the pup will make it, but I at least know that if she doesn't make it, it wasn't because she didn't get the care she needed. I'm at least happy about that. 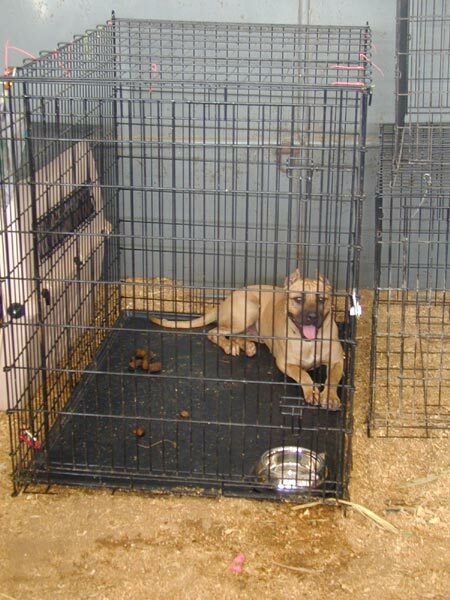 Being sick in the kennels with 1200 other dogs is no way to get individual care. About this time Melissa and Abby are over in Barn 5, packing the van and making final preparations to leave Gonzales. The weather sure is different than it was when we first arrived -the refreshing breeze and overcast cloud filter has been replaced with a cooking sun and impossible humidity. Melissa was near the area where they do intake at night when she noticed what appeared to be a reunion. 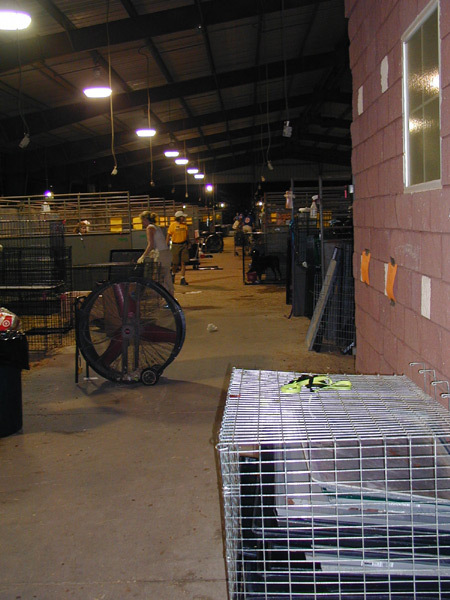 During our stay at Gonzales, we learned that over 6,000 animals had been processed at the makeshift animal shelter -and a little over 400 of those pets were reunited with their owners. So it's obvious that we did not get the opportunity to see very many reunions. Of the two we saw, one was obviously very pleasant -with a little boy bubbling with happiness at the sight of his dog. The other... well I just don't know. Some young men claimed that a young, rednose female was their dog, but they didn't have any photos for proof. And who would? 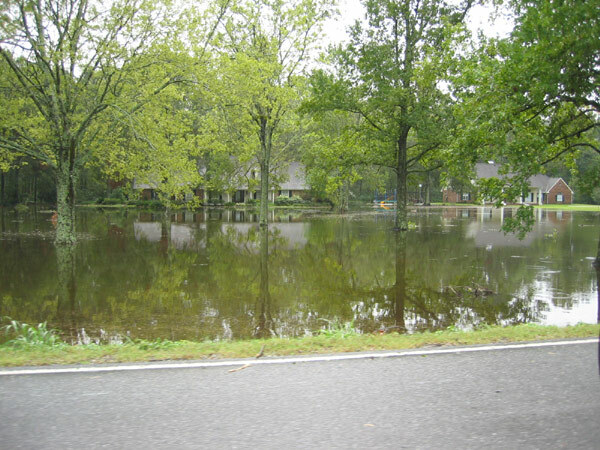 They probably lost everything when their home was flooded. But when they took the dog out of her crate, it seemed as if she had no idea who they were. When asked if they were happy they get their dog back, they said "Yes, ma'am. When asked if she was left behind in their home when they fled from Katrina, they said "No Ma'am, she lives in the yard". 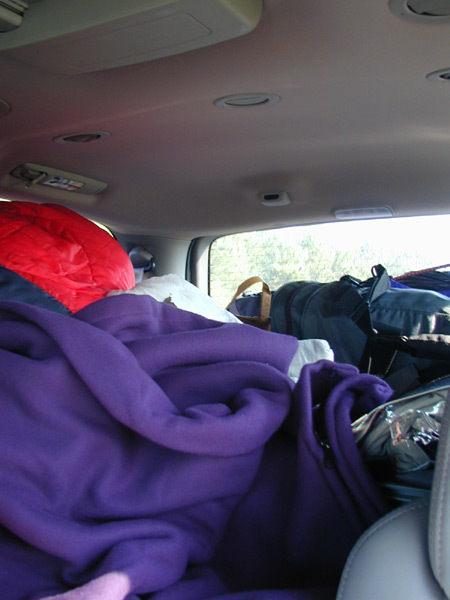 We get the car all loaded up and we're ready to go. We have found two dogs to rescue that we're bringing back. Neither dog is one of our favorites, but both need to be rescued and will be good fits for homes. They're good dogs. We named the female Nola - short for New Orleans, LA. The male we named Dixon, after the equestrian center he's called home for 3 weeks. We say goodbye to the BadRap folks we have been working with the past few days, and goodbye to all of the loving little faces in Barn 5. It's tough. On our way out of the kennels, we make one last stop, by Barn 2. I have four pictures to take of Michelle and I's new four-legged friends. It's only been five days, but I sure got attached to them. Our plan is to drive through the night and arrive home the next day. Tuesday, Sept 27 - okay, Nola is wimpering in the back. We cave, and bring her up front with us. She promptly crawls up on Abby's lap and spends basically the next 6 hours sleeping on her lap. It's quite possibly the cutest scene ever. Dixon continues to be a champ. He has already learned to kennel on demand, and is great on a lead. I wasn't the biggest fan of him at first, but he's really growing on me. We made a great choice. Choosing only two to save was one of the hardest decisions we've ever made. We finally arrive home. We're tired. Content. Everything looks and feels so different, like we are looking at everything with a completely changed perspective. My dogs are glad to see us. I want nothing more than to be a good parent to my two dogs. They deserve it - and too many other animals I've just spent time with should have it. Wednesday, Sept 28 - it's morning. Two nights in a row I've woken up in the middle of the night with that half-awake feeling that I should be walking the dogs. I see their faces. It makes me sad. There are so many left down there. Who knows what will become of them. I could have loved all of them. It's pretty crazy. Melissa just called. Nola passed away. She was sick - we knew that. But she had complications during surgery. Tears form. We had a chance to save two. Only two. And two days later, it's down to one. And she was so sweet. I pictured her snuggled up on Abby's lap. Licking my chin. She deserved better than this. The only comfort I have is that this poor dog, who knew little about being loved in the first few years of her life, at least was loved by four people for a week before she died. She'll be missed. And in the end, she has a legacy. I guess that's something. It's amazing to me how attached I became to that dog in 5 days. Five. I find it amazing that somehow she was left behind by her owner. I can't even imagine having to make that decision. It angers me. It saddens me. What is wrong with people?! I'm going to miss that dog. So when you ask, "how was it?" pardon me if I keep in short -- or maybe run too long in an explanation. There's no short way to sum up the emotion, and the experience of being there.